While browsing the New Year Honours list, one name in particular stood out – record producer Tervor Horn. He has been awarded a CBE for his services to music. About time, and rightly so. The list of records he’s worked on is staggering (viewable here) and always springs a few surprises. For example, I had no idea he worked on Jeff Beck’s recent Emotion and Commotion album, although now I know, it’s obvious his unique polish is present on that record. And therein lies the problem. He whistles by most of our ears unnoticed, with only a few gear headed geeks like me aware of his omnipresence in and continuing influence on popular music. I’m sure a lot of people will only have a vague recollection of his name and its tie with The Buggles’ famous MTV opener Video Killed The Radio Star. That’s a great shame. Anyone who knows how hard it is to write, record and produce catchy, memorable music will know just how enviable Horn’s talent is. More importantly, this guy ignited a passion in me for making music, which still captivates me to this very day. As a young boy, on first hearing Frankie Goes To Hollywood’s Relax, I was instantly addicted to its thumping kick drum/slap bass rhythm and explosive synth sounds (alas, I was far too young to understand quite what both the lyrics and aforementioned sounds were referencing). Innuendos and bans on radio play aside, Relax inspired me to sit at my Dad’s Atari ST for hours on end, surrounding myself with midi cables, GM sounds, Steinberg’s Cubase and straining sound modules to within an inch of their lives, endlessly trying to reproduce that sound, which I would hear again on countless Horn-produced tracks including most notably Yes’ Owner of a Lonely Heart. Sampled drum breaks and double-tracked acoustic guitars? On the same record? Mega, as I’d probably have said back then. I’m yet to find that sound, but I continue to make music. 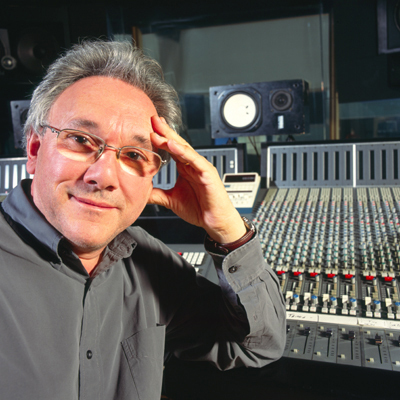 Trevor Horn is up there with my dad in terms of inspiration; two men I’m immensely jealous of in terms of how they fill their working day. I won’t delve into his other work, as there’s a great BBC article which recalls it perfectly, but I will conclude by saying that in this world of overhyped fly-by-night talent, those pioneers who have shaped the sound we hear emanating from every radio and music tv station are so easily overlooked. Rather than mourn yet another year without notable mention of Mr Forsyth, I suggest we celebrate the inclusion of one of the best producers of all time. A man worthy of mention alongside the great Quincy Jones.